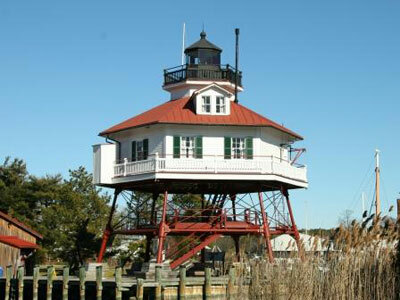 Drum Point Lighthouse is one of the few remaining hexagonal screw pile structures of the Chesapeake Bay. Originally located at the entrance to the Patuxent River, Drum Point Lighthouse was decommissioned in 1962. After years of neglect, ownership of the structure was transferred to Calvert Historical Society. In 1975, Drum Point Lighthouse was relocated to the Calvert Marine Museum in Solomons, MD.